This masonry base of wall detail shows a flexible thru-wall flashing mechanically fastened to the CMU backup through a termination bar, with a continuous bead of sealant along the top of the term. bar. Permissible by code but not consistent with best practice, the flashing does not form a drip edge or utilize an independent drip edge, rather it is held flush with the exterior face of the brick. The flashing has an 12-16″ (nominal) vertical leg to bring it higher than the mortar dropping collection device (MDCD). 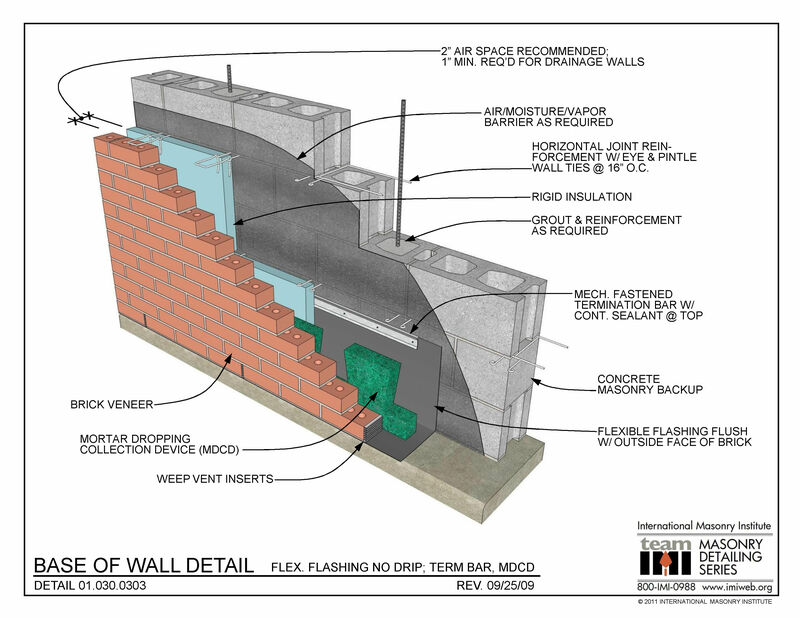 The wall has a 2″ clear air space for drainage, and weep vents are spaced at 24″ o.c. There is an air/moisture/vapor barrier on the cavity side of the CMU, and 2″ rigid insulation resides in the drainage cavity.